A public conference was held February 15, 2013 in Abidjan, Côte d’Ivoire, in order to publish the first results of the Coalition’s research project for the Protection of Genetic Heritage Africa (COPAGEN) on massive land acquisitions West Africa, in collaboration with IDRC, Interpares Redtac and the University of Montreal. 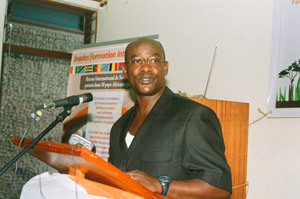 The public lecture was to inform a wider audience about the extent, actors and mechanisms of the phenomenon in eight UEMOA countries and Guinea area. Inades-Formation General Secretary delivering the opening speech. Public conference February 15, 2013 by COPAGEN on massive land acquisitions in West Africa saw the participation of several members of local and cooperative apex of agricultural sectors, of the Civil Society Organisations, members of diplomatic corps including HE Mrs. Ambassador of Canada, Madam resident representative of FAO, and for the government representatives of the Economic and Social Council, the Ministry of Agriculture, Ministry of Forestry of the Republic of Côte Ivory and Coffee and Cocoa Board under the Ministry of Agriculture. All have contributed to the richness of the debate on the massive land acquisitions, a theme at the heart of current events; since through it, it is the whole issue of sustainable development and poverty reduction in Africa that is asked. Although some say that the phenomenon of massive acquisitions of land dates from the colonial period in most African countries, it has grown at an amazing speed in recent years. Launched in June 2012, the draft study of COPAGEN clearly shows that massive land acquisitions in West Africa are gaining ground. At present, impact studies have not yet been carried out, but we already note that though countries experiencing food insecurity are targets for investments for the production of agro-fuels (gasoline produced basic foodstuffs), this is the case for Guinea. The nine countries  of West Africa covered by the study alone account for an area of land acquired more than three million hectares . However, this figure may know a rise because of recent cases were identified after the close of this first phase of research. 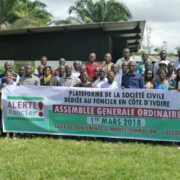 In Benin, it is the large-scale acquisitions of eleven thousand hectares that are realized without prior consultation with rural communities, in flagrant violation of their right to participate in public decision-making, as stated in certain international legal instruments. Guinea Bissau is an entire island, a refuge of exceptional biodiversity, place of worship and place of supply that has just been sold to foreign investors. Beyond the risk of loss of biodiversity, it is the cultural references of the local population that erode. In Ivory Coast, the majority of public and independent newspapers have announced the signing of a contract for one hundred thousand hectares for a multinational firm, in February 2013. The Ambassador of Canada in Côte d’Ivoire, HE Mrs Chantal de Varennes, in his introductory remarks at the conference, said that Côte d’Ivoire is one of the pilot countries of the G8 initiative on security food and nutrition, and the importance of scientific research brings results to assist the country in its march towards emergence. 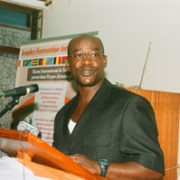 Dr. Mamadou Goita, Executive Director of IRPAD / Africa, presented a summary of the studies, with the first results on the mechanisms, extent and the actors involved. The exploratory phase indicates that the lands acquired were under the two regimes coexist in all the countries concerned: customary characterized by legitimate rights (legal in some countries) and the regime of modern law or legal rights . The trend of uses varies from one country to another and within the same country, from one region to another. Sellers / Cedeurs including customary power, local authorities (councils) of physical persons landowners …. Purchasers / buyers: individuals including political elites, economic, religious, national and local social, national and international companies, third-party states, intergovernmental organizations …. The perceptions of the actors are as diverse and do not refer to a single reality, but it has been possible to list the different arguments that the visions of the different parties involved in the transactions. Diversify agricultural activities to better contribute to development. This initial exploratory phase of the research has helped to identify the phenomenon of massive acquisition of land at a regional level. Many texts have been reported on the phenomenon in the South, but also in Sub-Saharan Africa. The study also confirms that the juxtaposition of modern and customary rights represents a considerable challenge for the management and administration of rural land in Africa. From the inventory study of nine countries, three countries were selected for an impact study, are: Guinea Conakry, Guinea Bissau and Côte d’Ivoire. In these countries, cases of large-scale acquisition are very new and have yet to establish an analysis of social impacts, environmental and economic. 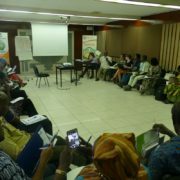 These studies follow a similar methodological principle to participatory research, where research is done in collaboration with peasant communities affected by the case of acquisitions in these countries.